We answered the question whether bad loans were really increasing for banks in the United States at the end of December. We look at Delinquency and Charge-off rates across banks for United States across different products in this post. The delinquency rate for any loan category is the ratio of the dollar amount of a bank’s delinquent loans in that category to the dollar amount of total loans outstanding in that category. Charge-off rates for any category of loan are defined as the flow of a bank’s net charge-offs (gross charge-offs minus recoveries) during a quarter divided by the average level of its loans outstanding over that quarter. In other words, Charge-offs are write-offs for loans. 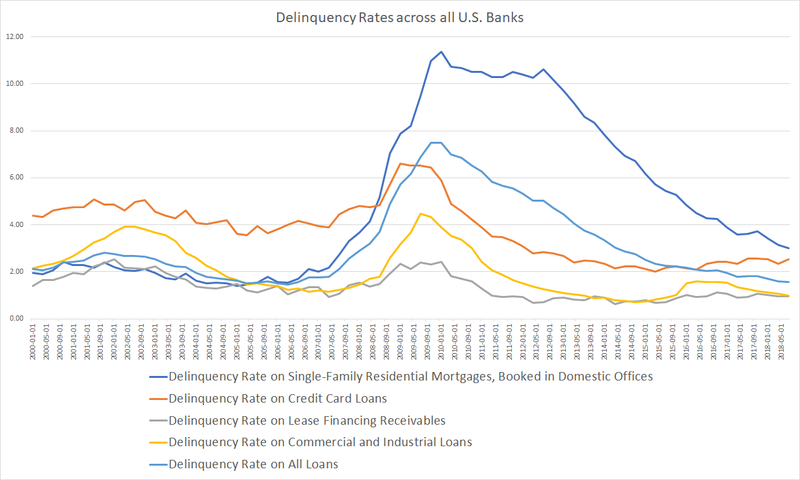 The relation between delinquency and charge-off rates and why are delinquency rates for mortgages and commercial loans higher than the charge-offs but not for other products? A loan first goes delinquent after it has been arrears for over thirty days and is subsequently charged-off if it continues being in arrears for a certain period of time (different financial institutions have different periods of time but in most cases this is ninety days). 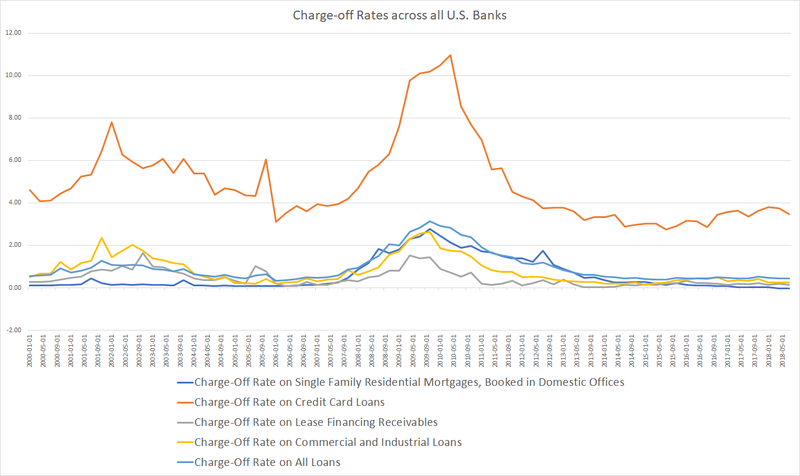 This technically means that charge-off rates are annualized over 365 days and delinquencies are a rolling window of about 90 days, hence charge-off rates are higher than delinquency rates. Mortgages and most commercial loans are secured (against an asset) debt. Consumer loans and credit cards are unsecured debt. Financial Institutions can recover most of the outstanding mortgage value or commercial loans by selling the asset unless the value of the asset (a home or other asset) falls below the value of the outstanding mortgage/loan value. That explains why mortgages have ultra-low charge off rates and commercial loans have low charge-off rates. We can also find negative charge off rates for mortgages occasionally – the reason is that financial institutions recovered more money than they expected and have to reverse the charge off from a previous period/quarter. All this is true except when property prices crash and charge off rates on mortgages soar (for instance 2009 and 2010). Additionally, owners could refinance to prevent a foreclosure. Owners who have enough equity in the property would generally be able to get a new deal or a payment holiday in certain cases. Delinquency Rates remain historically low after peaking in 2009-2010. Charge-off Rates remain historically low after peaking in 2009-2010. Are bad loans really increasing for banks in the United States?